Seventy percent of today's Midsize businesses are investing in technology to customize the user experience, improve customer satisfaction, build loyalty, and gain a competitive advantage. But the ability to deliver amazing user experiences is dependent on high-performance, reliable connectivity. It requires a business-class network. Join us on 16th January, as we showcase the Top 5 business-class features your network must have for you to automate and optimize the delivery of network services to drive your business success. The Live Upgrades feature allows the managed devices and APs in a cluster to automatically upgrade the software from ArubaOS 8.1 version to higher ArubaOS versions. Managed Devices in a cluster can be seamlessly upgraded by specifying the new image file and a target partition. · Cluster Live Upgrade is a feature introduced in 8.1.x version. · This feature works along with clustering. · It provides seamless upgrade of the controllers, APs with minimal RF impact. · No manual intervention required during the upgrade. · APs are logically partitioned and upgraded using AP image pre-load feature and thereby providing the coverage for the clients during the upgrade. Today’s mobile users have rendered the traditional enterprise network perimeter obsolete. Armed with three or more devices, these users continuously test network boundaries and force IT to accommodate anywhere, anytime access for everything from email to corporate resources. Mobility is a double-edged sword. It drives innovation and productivity. But it also creates serious challenges by breaking traditional security architectures and protective mechanisms that weren’t designed to accommodate the worker that’s always on the move. Join us to learn more. The surge in IoT devices and the increased speed of doing business on mobile and cloud applications are leading us to the question — can the network infrastructure support it? Today’s network infrastructure needs to ensure that connectivity, security and smart network management complement each other so that all devices, can securely connect. Aruba provides the industry’s most comprehensive switching portfolio designed for a variety of markets and customers, and offer high performance, scalability, with a wide range of features that dramatically reduces network complexity and lowers cost of ownership. Clarity is a new module that interacts with Aruba AirWave to deliver powerful and intuitive forensics, allowing IT teams to anticipate and quickly resolve connectivity problems before the user is affected. AirWave Glass is built from grounds up using the latest cloud computing technologies primarily the ELK (Elastic, Logstash, Kibana) stack. Unlike the master console, Glass aggregates and stores the data that is required to build dashboards and reports onto the platform itself. · AirWave Glass Basic Workflow. · Glass and AMP configuration. As workforces become increasingly mobile, the reliable delivery of Unified Communication and Collaboration (UCC) applications like Skype for Business is of utmost importance. Cloud-based business applications are cost efficient alternatives for small and medium business (SMB) – are your customers able to support this transition? Join this webinar to learn how Aruba’s Wi-Fi solutions enhance your customer’s network infrastructure, reduce costs, and improves productivity by providing reliable connectivity when using cloud-based business applications like Office 365, Skype for Business and other UCC applications. Se la densità di dispositivi mobili, IoT e di applicazioni di streaming video sta aumentando all’interno della vostra azienda, gli access point 802.11ax sono la soluzione da tenere in considerazione per il futuro. Siete pronti per supportare i nuovi client 802.11ax (Wi-Fi 6) quando si diffonderanno all’interno della vostra rete? Partecipa al nostro Webinar Venerdì 5 Aprile alle 11 dove Andrea De Santis, Account Manager Aruba, condividerà i punti più importanti da considerare al momento di decidere quale tecnologia implementare per fornire al proprio business, staff e ospiti, una rete di livello enterprise e semplice da usare. La industria está haciendo ruido sobre el estándar 802.11ax Wi-Fi o WIFI6 que esta ya disponible y que aumentará en gran medida la velocidad inalámbrica y optimizará la vida útil de la batería del cliente. ¿Estás preparado para llevar tu red al siguiente nivel? Únete a nosotros el 5 de abril, a las 10 am, donde Jordi García, Ingeniero de Sistemas de Aruba, donde compartirá las tres claves principales que se deben considerar para decidir qué tecnología le dará a su empresa, empleados e invitados, una red de clase empresarial simple y sin sacrificio. A indústria esta a fazer bastante barulho sobre a tecnolia recem lançada 802.11ax Wi-Fi, um novo padrão que irá aumentar drasticamente a velocidade da rede Wireless e otimizar o uso da bateria dos clients. Estas preparado para levar sua rede para um novo patamar? Participe do nosso evento no dia 04 de abril as 10h. Gustavo Denes, Account Manager em conjunto com Jordi Garcia, System Engineer, irão partilhar quais os três principais pontos a serem considerados sobre qual tecnologia é a melhor escolha, levando em consideração empregados, convidados, simplicidade, e uma solução voltado para um ambiente empresarial. Mars, c'est le mois de la Cybersécurité ! C'est l'occasion de (re)découvrir l'offre de sécurité Aruba à 360º ! Aruba Central user may need a centralized web-server to host captive portal page for their distributed networks across the globe like coffee shops, restaurant or hotels. Aruba central 2.0 has a new feature called Cloud Guest or Guest Management that allows administrator to create a splash page for guest users using Web server and radius server running in the cloud. We’re all waking up to the fact that we need to start securing our wired edge networks. In theory this should be no different from securing wireless; and covered by the same access policies. The trouble is that the wire has always worked, instantly – and understandably we don’t like to mess with that! How do we recommend that wired security is approached to ensure a successful deployment? Join us to find out! Whether you’re expanding a network to support new initiatives, navigating through growing security challenges, or planning a refresh of older technology; keeping costs down and saving time for your IT Team is key. Join us as Aruba welcomes our featured speaker, Brandon Butler of IDC, to discuss how you can simplify day-to-day network administration tasks and increase visibility and control to save you time and get the most out of your network. The role of a Chief Information Security Officer is fraught with new threats inside the organization from compromised users, negligent employees and malicious insiders. To find these threats, security approaches must now also deal in the world of “gray”—small signals that must be detected, put in context over time and added up to indicate pending harm. This webinar will show how Machine Learning (ML) is best suited for this mission. Workplaces are transforming - from cubes and square footage, to any location, any time, with mobile devices running a mass array of applications. That's why it's crucial to choose access points and network management tools that deliver the best-connected guest and employee experience and can be deployed and managed with minimal IT resources. Join us on 27 February, for our "Bring Your Business Up-to-Speed with Smarter, Better Wi-Fi" webinar and get a chance to experience intelligent cloud networking for yourself. •Detect user-level activity to better prioritize applications and optimize your network. ClearPass OnGuard agents perform endpoint posture assessment and ensure that compliance is met before granting access to the network. This session will cover the ClearPass OnGuard Agent components and work-flow in detail. 86% of midsize companies agree that digital technologies are disrupting their industry. Your network has never been more critical. It is the on-ramp to your cloud applications. It is the way your mobile users connect, work and collaborate. And it is what enables amazing, memorable customer experiences. Choosing the right network solution has never been more important. Join us on 6th February to learn about the latest trends and the Top 5 things your business network can't live without. 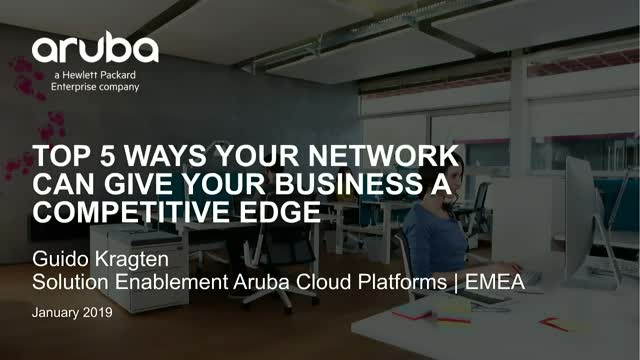 Whether it’s learning how to better defend against cyberattacks or reduce planning, deployment and operational costs – this collection of insightful webcasts reveal how you can build smarter, safer digital experiences with Aruba.